So we're back in Malaysia. This time over in Borneo. It's great to be back here. I love Malaysia and the people are fantastic. For the first 12 days here we joined a tour group called intrepid. We had one night in town before we met the group, then it was off to the hotel to find out what we were in for. There were 12 of us on the tour - 5 couples and 2 singles. We all went out for an Indian, which we ate with our hands off banana leaves. Then we went on for drinks. First impressions were great. The group clicked instantly and I knew we were in for a good time. 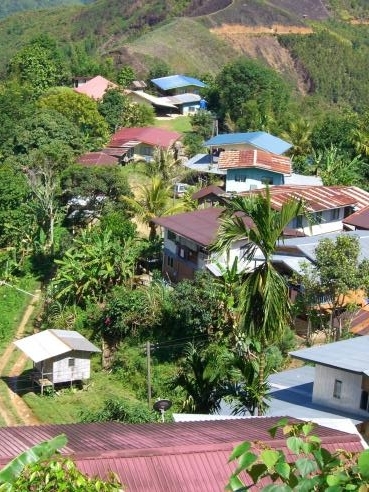 The next day we iled into 2 jeeps and left Kota Kinabalu for the hills to stay with a local village called Kiau. As soon as we left the heavens opened and I crossed my fingers and closed my eyes as the rain reduced visibility to a matter of metres and we found ourselves in the hands of a Malaysian driver on a windy mountain road! as we approached the village tho the sky began to clear and we had fantastic views of hanging cloud in the tree lined valleys below. The village consisted of wooden stilted houses which left you wondering how on earth they are standing. We were greated by the local people playing gongs and the children did some dancing for us followed by the usual dreaded audience participation. We soon realised that most of the villagers were half cut. Not only was it sunday but harvest festival which roughly translates to much drinking of rice wine. Sounds worse than it is (and looks it) but it actually tastes quite like regular wine as we were about to find out. We had dinner at the home of our fantastic mountain guide Supingi. We ate with our hands, sat around on the floor (this is the done thing and not us turning into complete slobs) Then came the rice wine, which by the way its rude to turn down and also should be drunk in one go and not sipped - recipe for disaster!. We each had two fingers of the stuff poured. Then we had to drink it in one and hold the cup over our heads. If the cup dripped you had to do another two fingers...and so on. then we all introduced ourselves and partied with the locals, dancing to vengaboys and other such hiddeous euro-pop. They were great people and we had a good laugh.